Jungle Supply Co. is a family business based in Newcastle, California. We have been growing a variety of different bamboo species and tropical plants over the past 15 years. We transformed our 4 acre property into a literal jungle that resembles the monsoon forests of Southern China. Bamboo has been the central design theme for our property and our home. Not only is it a beautiful plant, but it is also an eco-friendly timber and has a wide variety of uses. 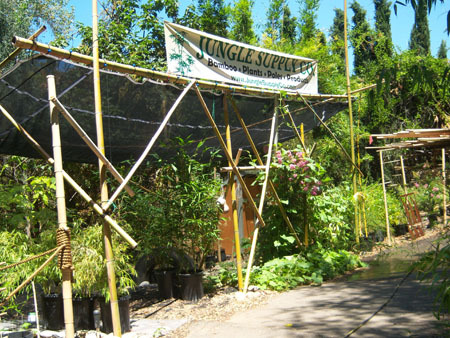 Our passion for bamboo inspired us to form Jungle Supply Company as a way to provide beautiful high quality plants available for wholesale purchase. 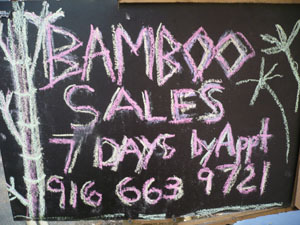 Landscapers and contractors are welcomed to stop by and handpick bamboo for their next project. It is a great example of how bamboo can transform a landscape into something beyond the imagination. Our property has been featured in Sunset Magazine and the Sacramento Bee. Bamboo has also been used as fencing and as a landscape accessory throughout the property. Bamboo is of high cultural value in throughout the world, especially in East Asia. It is used as a building material, food source, garden accessory, and has countless other uses. It grows in a wide variety of climates, ranging from the cold mountians of the Himalayas to sub-Sarahan Africa. Dried timber bamboo is ideal for building purposes. It is both lightweight and exceptionally strong when dried. We hope to provide you with this remarkable plant and see you enjoy its many benefits and primative beauty.